If there's one journalist whom the Media Research Center sees as a threat to President Trump, it's CNN White House correspondent Jim Acosta. It seems that every time Acosta appears on TV, the MRC has a post designed to denigrate and belittle him for failing to be a Trump sycophant. For instance, a July 1 post by Nicholas Fondacaro rants about Acosta's alleged "out of control shouting, grandstanding, and childish antics," insisting at he was "acting all self-righteous" and "indignantly proclaimed" his need to ask questions of the president. That kind of biased, negative language to describe Acosta is a key part of what the MRC does to delegitimize Acosta for doing his job. The MRC also cheers every time Acosta is attacked in other forums: For instance, Scott Whitlock gleefully transcribed White House press secretary Sarah Huckabee Sanders' insult to Acosta that "I know it's hard for you to understand even short sentences," and Curtis Houck happily reported how a crowd at a pro-Trump rally heckled "carnival barker" Acosta. 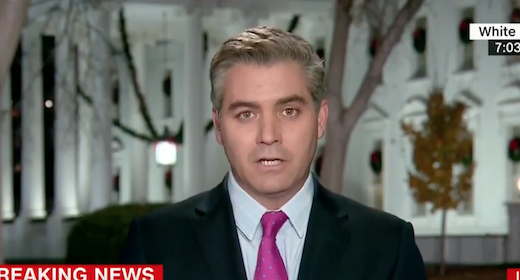 Houck -- apparently the MRC's designated Acosta-hater -- also ended 2017 with a post compiling what he claimed were "the Top Ten Jaw-Dropping Jim Acosta Meltdowns from 2017," adding: "In 2017, CNN senior White House correspondent Jim Acosta gave viewers free doctorates in how to become showboaters and throw hissy fits. This is all on top of Houck mocking Acosta for demanding that people like Houck quote him in context -- which Houck did in the most derisive way only after being shamed into it.